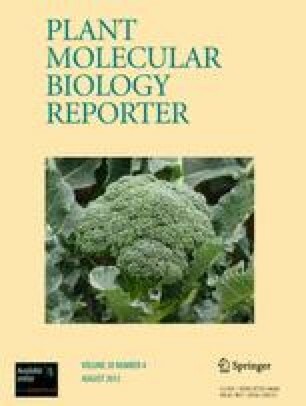 The BcMF22 (Brassica campestris Male Fertility 22) gene was isolated from Chinese cabbage-pak-choi (B. campestris L. ssp. chinensis Makino, syn. B. rapa ssp. chinensis). The cDNA clone of BcMF22 was 1,870 bp in length and contained an open reading frame (OFF) of 1,260 bp, while the genomic sequence contained no introns. Sequence prediction indicated that BcMF22 might encode a methytransferase. Spatial and temporal expression analyses indicated BcMF22 was preferentially expressed in pollen. Transcripts of BcMF22 were first detected in pollen mother cells and continued to be present in mature pollen. In addition, transcripts were detected in pollinated pistils, approximately 4 h after pollination (4HAP). These results indicated that BcMF22 might be a pollen-preferential gene and was closely involved in pollination. This work was supported by the Natural Science Foundation of China (No. 30871715), the Natural Science Foundation of Zhejiang Province (2010 C12004) and the Key Sci-Technology Project of Zhejiang Province (No. Y3100300).